Let's enjoy a short, sweet sip of robo-tea! It is also being released for free, so even if you didn't get a chance to play the first game, you still can get a taste of what happened. Thank you, friends! I hope we have many more cups of robo-tea together! yes, you may letsplay! -- please let me know if you do! feel free to leave comments/encouragement! 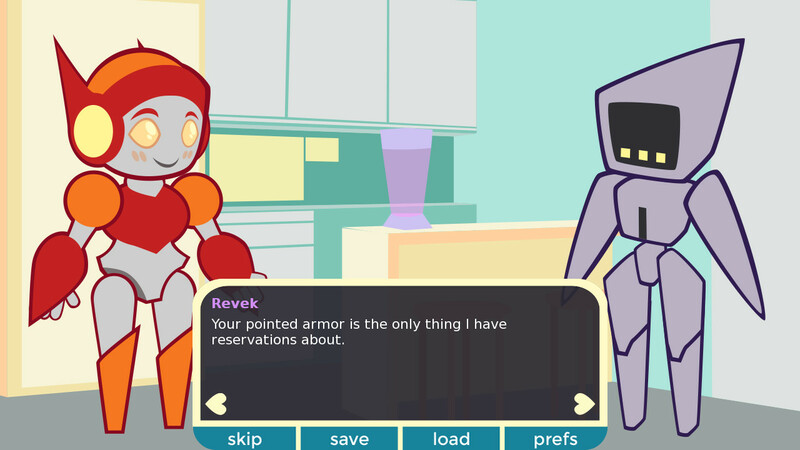 -- I love knowing how things went for you in the game, and gathering info for future games! Please download the zip file. Once it is fully downloaded, unzip it and go to the application file. It will have a little character for the icon. Open the game, and you're off to a robot world! I love your games so much and I can't wait until 2nd serving comes out! Sparkle shakes are such a cute concept that they have already given me cavities. Thanks so much for putting your adorable concept and characters into fruition with this game; I absolutely loved the little slice that we got with this version, and I cannot wait to play the full game too! 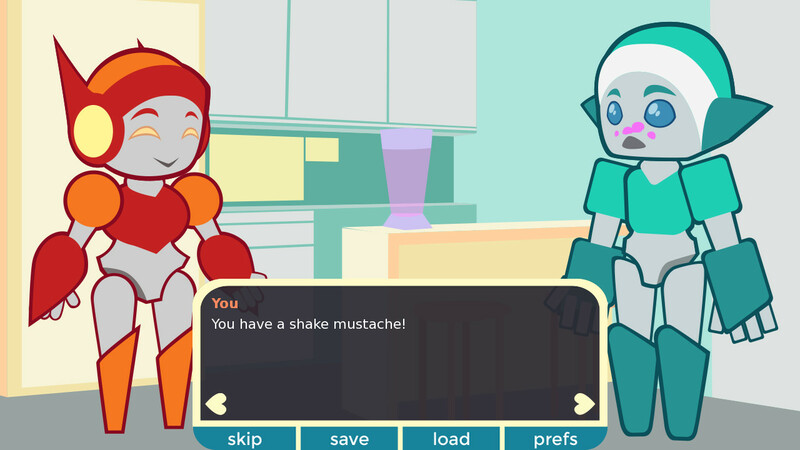 Please keep making sweet queer games - the world definitely needs more of them. I did do a let's play of this particular game, and you can see it below. I hope you have a great day, and best of luck with that sequel!! aaaa!! I'm so glad you enjoyed the game, knowing the feelings it brings to others is so rewarding for me. Watching your letsplay was so much fun! I actually had to pause and do a happy dance from time to time, your commentary was awesome! Great little game, sweet as cinnamon roll. I wonder if it might be considered therapeutic bc sometimes you NEED to be somewhere else where everything is sweet and cozy and everyone are nice to you and this game provides it all. Sadly, but as more days pass by i feel like i could use such "safe spots" more often. So THANK YOU! so much for making this game and also, for the secret note, it was a very sweet thing of you to make. I do see this game series being a "safe space" or "therapeutic" game, and keep designing each one with that in mind. It is so important to find a place where you're safe and are met with kindness. I'm so glad that you enjoyed!! and I can't wait to share the rest of the series in the future!